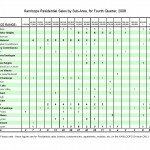 There is a lot of confusion about the state of the Kamloops, B.C. and National real estate market. Buyers and sellers are trying to figure out when the right time is to make a move. 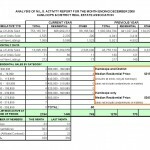 Below I have included my 2008/2009 real estate market report. Click the link for the pdf version and also for those who cannot open the pdf there are images of the document. In Kamloops, I continually talk to clients regarding the local real estate market and the factors contributing to the recent downturn. There are many predictions and opinions about the market. Below I have compiled a series of analyst opinions on the BC and national real estate market which in turn directly apply to Kamloops real estate. 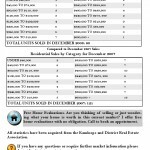 Hopefully you will find this information useful to your search, whether you are a home buyer, seller or just looking for some clarification. 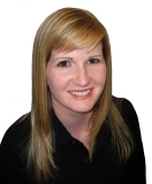 Scotiabank’s senior economist Adrienne Warren says Canadian real estate prices will drop 10-15% nationally, with B.C., Alberta and Saskatchewan taking the brunt of the downturn. They predict that much of the runup in prices seen this decade will remain intact. 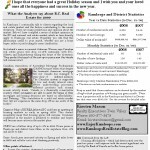 Cameron Muir of BCREA believes BC could see an upswing in housing markets as early as spring 2009. This doesn’t necessarily mean that housing prices will increase. Consumer confidence in the market is predicted to stabilize and buyers will become more active in the market place. CMHC see a further drop of up to 9% in 2009. 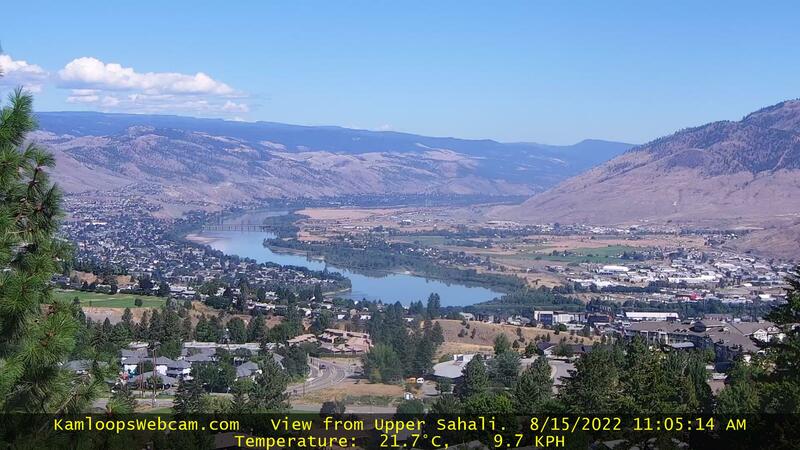 Home prices in Kamloops and district have fallen so far anywhere from 10% and above to date. 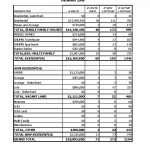 Ozzie Jurock sees increased activity in Spring and sales lower in 2009 and calls for us to start thinking positively. Housing affordability – which had deteriorated over the past two years – will improve with the recent significant rate cuts by the Bank of Canada and softer house prices. 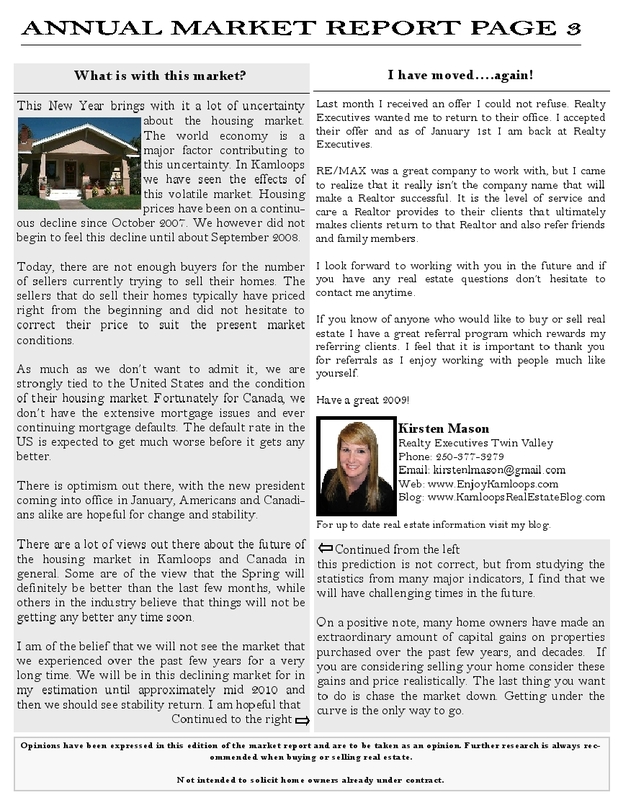 They all agree that consumer confidence is one of the real estate market’s biggest challenge. There is a lot of uncertainty locally in Kamloops and in the world as a whole. Predictions are never certainties. There are a number of factors that affect consumer confidence and unfortunately this confidence is not only a local and national feeling but also a world wide concern. Low cost ways to improve your home’s interior. 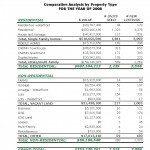 What is your home worth? 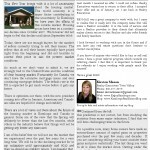 Click here for a free online home evaluation. When it comes to the sale of your home, it is the little things that can go a long way to increasing the price you will receive. Most buyers respond positively to a clean, clutter-free home that is in good condition. The more effort you put into the appearance of your home, the more likely you’ll receive greater activity and possibly generating a higher profit.Over time, we become accustomed to our homes, often overlooking the eyesores and the list of honey-do’s that were never completed. Clutter accumulates. 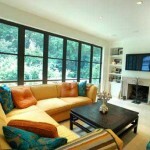 There are numerous smaller, inexpensive things you can do to greatly improve the showing of your home. With a little elbow grease, and a little creativity, it is easy to keep your home in prime showing condition. 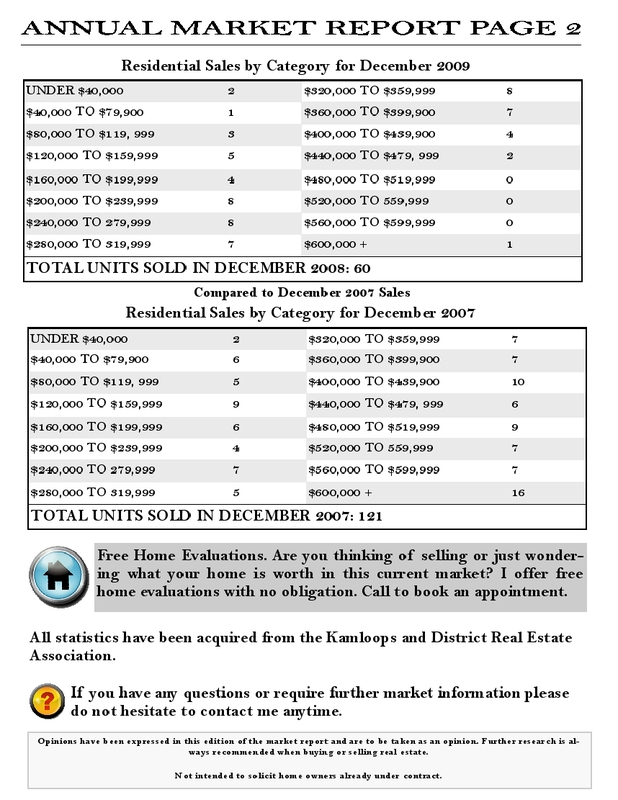 Kamloops And District Real Estate Association Statistics For December 2008. 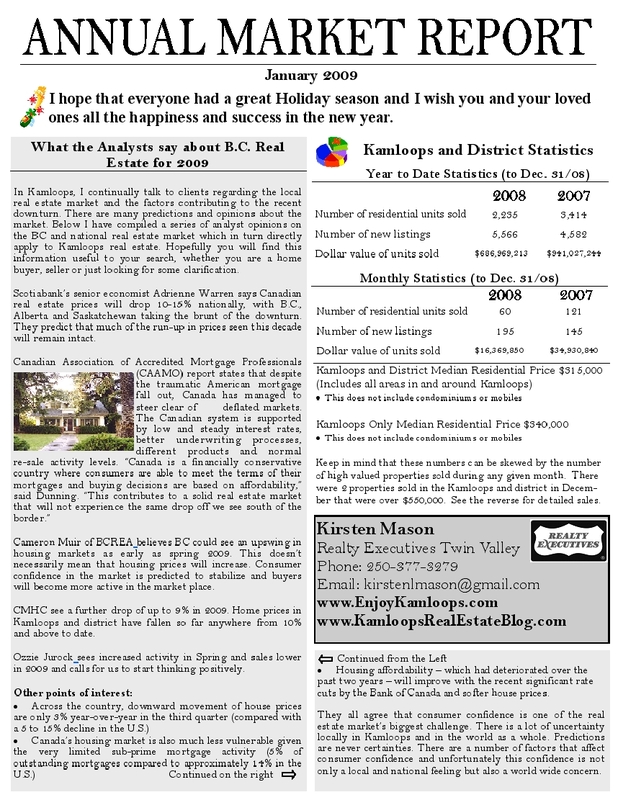 The latest Kamloops Real Estate statistics for your reading pleasure. 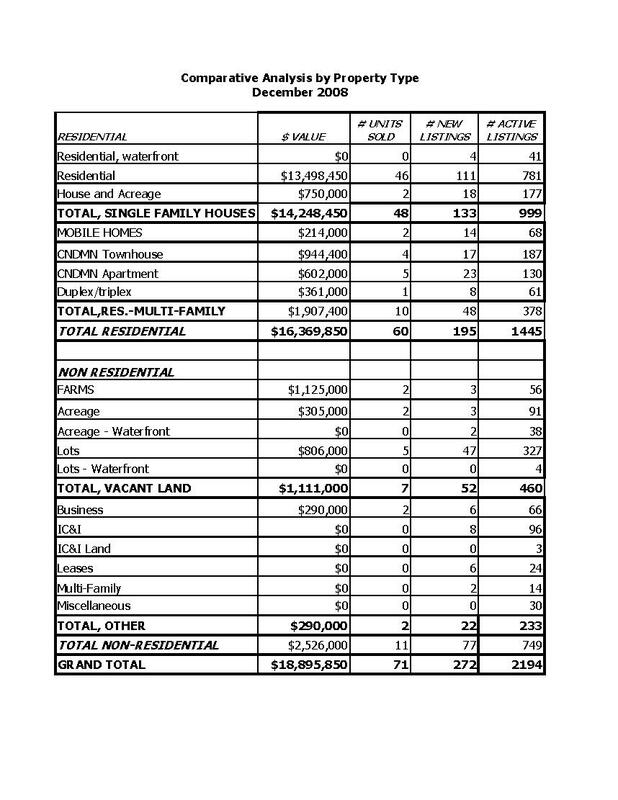 Kamloops Real Estate, Comparative Analysis By Property Type For December 2008. 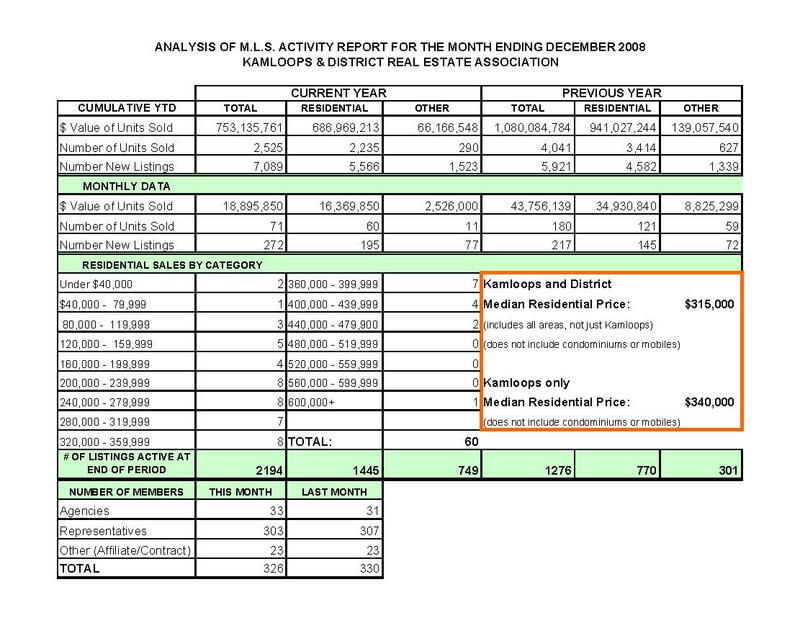 Kamloops Real Estate, MLS Activity Report For December 2008. 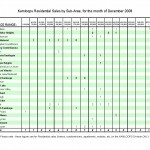 Kamloops Residential Real Estate Sales By Subarea For December 2008. 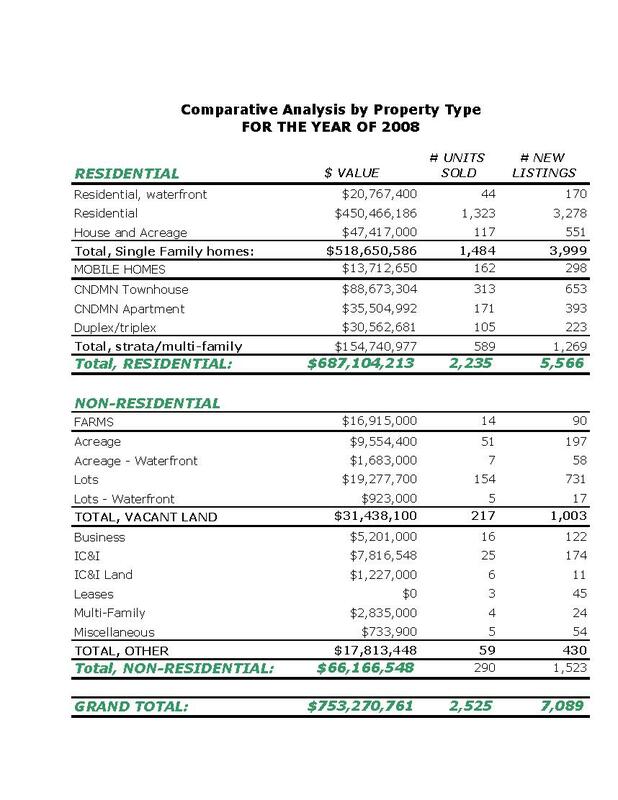 Kamloops Real Estate, Comparative Analysis By Property Type For the Year of 2008. 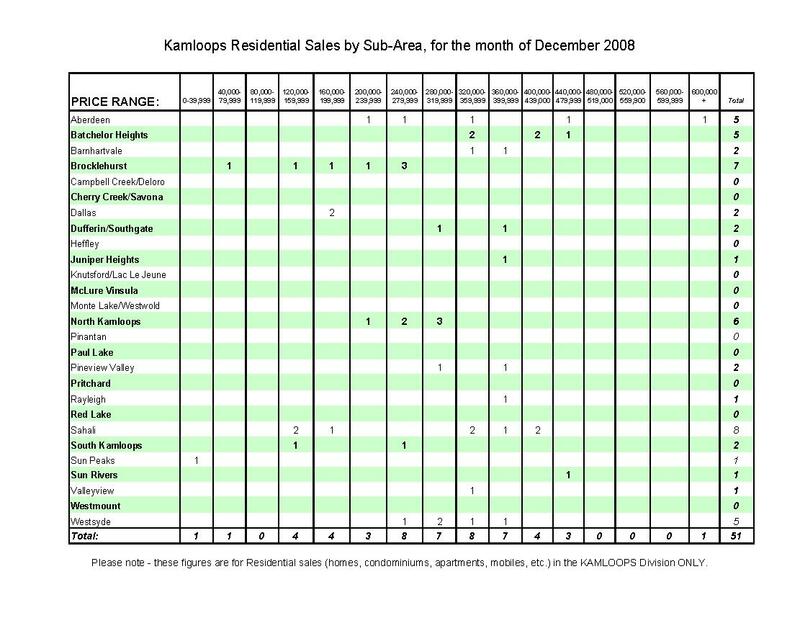 Kamloops Residential Real Estate Sales By Subarea For the 4th Quarter of 2008. 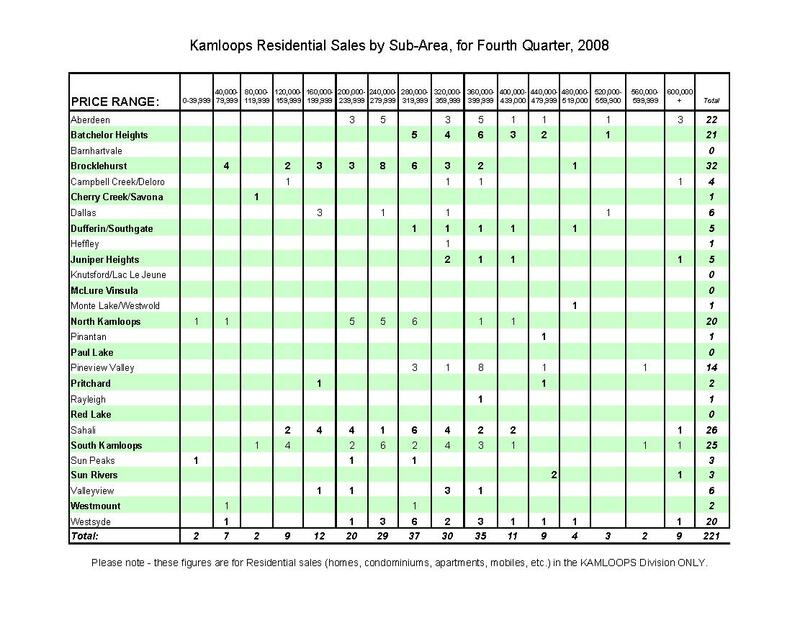 Kamloops Residential Real Estate Sales By Subarea for the 4th quarter 2008.